27 cards submitted by pkryschtal on Monday, October 15th, 2018. What are nine potentially hazardous roadway conditions? Roadway departure involves vehicles collisions with fixed objects on or off the road or rollover of a vehicle occurring on both straight and curved sections of the road. The hazards include steep side slopes, drainage ditches, and narrow shoulders. Examples of hazardous road surface conditions include potholes, reduction in surface friction, pavement edge drop-offs, wear, inadequate drainage, and incomplete winter maintenance. Narrow roadways reduce the amount of room to maneuver, making them unsafe in every situation. Bridges are especially hazardous when they are narrower than the approaching roadway, as the drivers are more likely to strike the curbs, approaching vehicles, etc. Since trains cannot stop quickly or steer out of the way, collisions with a train and railroad crossings are very hazardous. Work zone signs are sometimes disregarded or are poorly marked and hard to see. This in combination with the increased construction workers and equipment on the road, congestion, and changing traffic patterns makes work zones very hazardous. Hazards such as obstructions, blind spots, inadequate signage, and confusing turn lanes common at intersections make them dangerous. Increase in population and vehicle miles traveled makes roads that were once designed for fewer cars dangerous as they start to accommodate this increase of traffic. This extra traffic is susceptible to hazards caused by sharp curves and lack of medians. Driveways and entrances are dangerous since they require alert drivers prepared to act quickly. Fatalities of pedestrians and bicyclists are increasing as our populations grows and increases; therefore, efforts to control speed and accommodate this pedestrian and bicycle traffic must be implemented. Typically, which jurisdiction or agency is responsible for Interstate highways? Typically, which jurisdiction or agency is responsible for State routes? Typically, which jurisdiction or agency is responsible for Federal Park Roads? Typically, which jurisdiction or agency is responsible for Local roadways? What 5 steps do highway engineers take to prioritize safety needs? What examples are given for practices in improving safety on bridges? If, during a three-year period there were 4 fatalities and you were to choose to upgrade the bridge rails (reduces by 75%), what would be the expected number of crashes for the next three year period? What are 3 methods that can be used to enhance bicyclist on-road visibility from motorists? What funding sources can be used to address safety problems? Which source is typically used for safety related to Interstate Maintenance? What 4 methods are most commonly used to identify a particular section on a road? If there are a lot of overturned vehicle crashes in a particular area and it has been determined that the shoulder is inadequate, what possible studies can be performed? If there are a lot of overturned vehicle crashes in a particular area and it has been determined that the shoulder is inadequate, what safety enhancements can be made? Briefly describe the difference between a Road Safety Audit versus a Traditional Safety Review. Imagine that you are conducting a Road Safety Audit for a 4-mile rural roadway to be constructed and your design is 40% complete. What RSA Phase and Stage would this Road Safety Audit be considered to be? Do you think that more data might be helpful? What types of data and why? Yes, other data might be helpful. Increasing the scope (3 or 4 years before and after instead of 1 year) could provide a better picture of what really happened because sometimes the drivers take a while to fully adopt certain improvements. Breaking the data down by injury type could be helpful information to see what types of injuries reduced due to the changes. Finally, comparing the change in population of the subject area to the trend seen in the data could be useful information to present to the client. Assume that after a Road Safety Audit is completed with a cost of $80,000 for changes are made to improve safety on a 10 mile corridor. 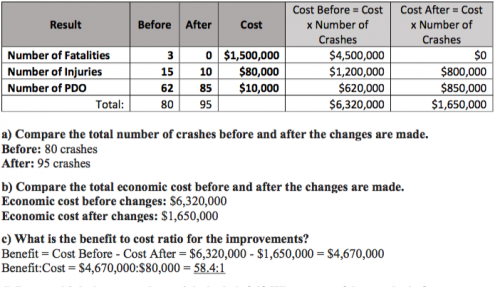 Given a table showing the number of crashes in a one year period before changes were made and a one year period after changes were made, Compare the total number of crashes before and after the changes are made, Compare the total economic cost before and after the changes are made, What is the benefit to cost ratio for the improvements?